Research has shown that just over 7% of all equine deaths in the UK are due to laminitis, which explains why it is a disease feared by many horse owners. A number of causes have been identified that all result in the same painful, debilitating symptoms. Nutrition related causes are probably the most common and so dietary management is key to reducing the risk of a horse or pony getting laminitis. The layer of tissue which bonds the hoof wall to the pedal bone is known as the laminae. Laminitis occurs when the laminae becomes inflamed, resulting in severe pain, as the hoof wall is not able to expand to accommodate this swelling. In severe cases, the laminae fail allowing the pedal bone to rotate downward and even push through the sole of the hoof. The disease is more commonly seen in the front feet and horses suffering from laminitis often adopt a classic stance of rocking back onto the hind legs to take the weight off the front feet. Other symptoms include a pounding digital pulse, heat in the feet, and a reluctance to move. 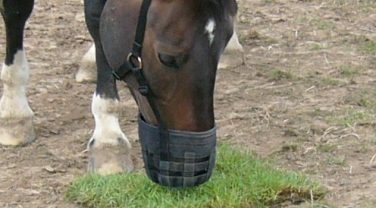 Dietary-related laminitis is usually induced by excess sugar (also known as water soluble carbohydrates) and starch, the main sources of which are grass and cereals respectively. Sugar and starch are normally absorbed in the small intestine, but if too much is consumed at one time, an overload can occur meaning that it passes on to the hind gut. Here, bacteria digest the sugar and starch producing stronger acids than would be produced by fibre digestion. The acidic environment results in the death of bacteria, resulting in the release of toxins which can enter the bloodstream through the gut wall which is made more permeable by the increased acidity. This is thought to trigger a series of reactions that ultimately activate damaging enzymes in the laminae resulting in the failure of the bond between the pedal bone and the hoof capsule. Metabolic Syndrome is typically used to describe individuals that are overweight with an altered metabolism typically including insulin resistance. Certain areas of fat stores are thought to become metabolically active releasing hormones such as adipokines that reduce sensitivity to insulin and cytokines that are pro-inflammatory, resulting in a chronic low grade inflammatory state. These changes affect the health of tissues and are likely to ultimately weaken the laminae, which makes the horse or pony more susceptible to laminitis. The key to reducing the risk of laminitis in these cases is clearly to reduce the amount of fat the horse is carrying. Horses and ponies prone to laminitis should never be starved. The horse must continue to receive a good level of fibre in order to reduce the risk of gastric ulcers and colic. Most people are aware that pasture access has to be limited for horses and ponies prone to laminitis. They can consume a lot of energy (calories) when grazing – some individuals can consume up to 5% of their own bodyweight as grass. If grazing has to be restricted, divide the daily forage ration into as many small feeds as possible to keep the period of time the gut is empty as short as possible. This will also help to reduce the risk of colic and gastric ulcers. Make sure the diet is balanced by using a low calorie source of vitamins and minerals such as supplements or balancers. Don’t be tempted to give treat feeds – remember that half a scoop of mix provides enough energy for 20 minutes schooling! Founded in 1998 by Robert Eustace FRCVS, The Laminitis Trust raises money for research projects through donations, bequests and fundraising initiatives, enabling greater investigation into the causes of laminitis and any possible cures. Another function of The Laminitis Trust is to co-ordinate educational campaigns to warn horse owners of the dangers of laminitis and provide informed advice and recommendations. As part of this, The Laminitis Trust Approval Mark was introduced to identify feeds that are considered suitable for the healthy maintenance of horses and ponies prone to, or suffering from, laminitis. The mark was developed after consultation with the Veterinary Medicines Directorate, and is awarded to feeds that reach certain standards as outlined by the Scientific Committee of The Laminitis Trust. Approval is given to feeds that are low in rapidly fermentable carbohydrates (sugar and starch) and high in fibre, made using high quality ingredients with high standards of quality control. Annual inspection of the manufacturing mills is also required to ensure that these high standards are continually being met. 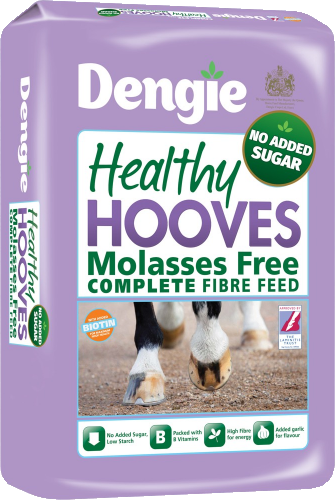 Dengie has four products approved by The Laminitis Trust which advises: “Do be aware that some companies create their own laminitis marks but these are not the official Laminitis Trust Approval mark. If you are in any doubt check the Trust’s website.